Many of us still have dozens or even hundreds of VHS tapes which it would be convenient to transfer to DVD before they disintegrate. 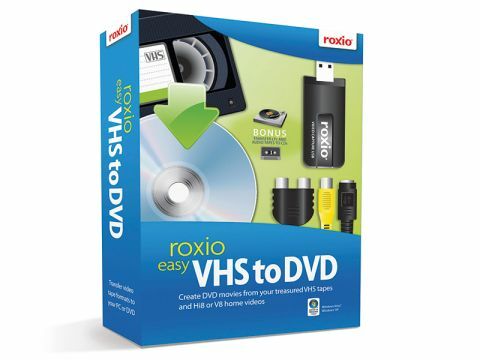 Roxio's Easy VHS to DVD toolkit is a solution. The package consists of an interface with composite-and S-video and stereo audio inputs, and a USB2 output; and a bundle of PC software. In theory the whole process is easy; you play the video on your VHS player or camcorder, capture to your PC, edit and colour-correct – you can then burn to DVD, MiniDVD, VCD, or SVCD (with menus and chapters where relevant), or convert to YouTube format. You can import a range of video formats including AVI, MPEG-1/2/3, WMV and QuickTime. You can even capture audio from tape or LP, getting track information from the 'net. The result can then be burnt to CD, or converted to iPod-or Sony PSP-compatible formats. Also included are label creation and picture management functions making this a very comprehensive package with all necessary hardware, software and cables included. It's also very well priced, considering the large amount of software included. However, the system won't handle 'protected' video, and in some cases thinks poor-quality video recordings with lots of drop outs are protected, so you may need a sync signal restorer if your VHS material is poor. Will your DVDs last as long as VHS? DVD-Rs might be a bad bet in the long run!